Elderflower Hydrosol is distilled from the ancient Elder tree. The Elder tree is sacred to the Druids. The Elder represents the 13th month, the month of the winter solstice, as part of the Ogham, which is the calendar tree of the Celts. The solstice is a time of transition between light and dark...death and rebirth. She has long been associated with the fairy world and Elder is considered to be a plant of the faerie land. It is believed that wood spirits and elves make their home in her roots. Elder grows almost anywhere fast and has the ability to sprout new growth from seemingly dead wood. So it is also known as the tree of life. 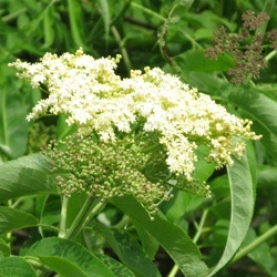 Elder is known to be "the medicine chest of the country folk"
Therapeutic and Energetic Uses of Elderflower Hydrosol:Has distinctive immune boosting properties- According to Suzanne Catty, "Take one teaspoon every hour at the first sign of a cold and you probably will never succumb to the infection."